The Time to Worry about a Crash is When the Experts Say It Can’t Happen. Market crashes often happen not when everyone is worried about them, but when no one is worried about them. Complacency and overconfidence are good leading indicators of an overvalued market set for a correction or worse. Prominent magazine covers are notorious for declaring a boundless bull market right at the top just before a crash or correction. 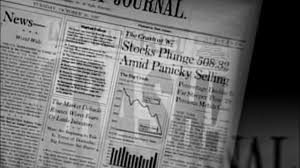 Last week saw the thirtieth anniversary of the greatest one-day percentage stock market crash in U.S. history — a 22% fall on October 19, 1987. In today’s Dow points, a 22% decline would equal a one-day drop of over 5,000 points! I remember October 19, 1987 well. I was chief credit officer of a major government bond dealer. We didn’t have the internet back then, but we did have trading screens with live quotes. I couldn’t believe what I was watching at first, but by 2:00 in the afternoon we were all glued to our screens. It was like being a passenger on a plane that was crashing, but you had no way out of the plane. Our firm was fine (bonds rallied as stocks crashed), but we were concerned about counterparties going bankrupt and not being able to pay us on our winning bets in bonds. This article uses the anniversary as an occasion for interviews about the state of the markets today. What’s troubling is that a lot of commentators said that the kind of crash that took place in 1987 couldn’t happen today and that markets were much safer. It’s true that circuit breakers and market closures could temporarily halt a slide better than we did in 1987. But those devices buy time, they don’t solve the underlying fear and panic that causes market crashes. In any case, when I hear market pros say “It can’t happen again” it sounds to me like another market crash is just around the corner.